Photo collage of Hymie's and Murray's exterior signs. The two Jewish delis have stood opposite each other for decades on Montgomery Avenue, in the tony suburb of Bala Cynwyd, staring each other down. Hymie’s Deli (342 on the thoroughfare in question) is around the corner, just to the north of Murray’s (285), where it can’t be spied with the naked eye. Walk 20 paces though, and there it is. That two Jewish delis have stayed in business for so long in such close proximity would not have been notable in the 1930s or 1940s. But today this old-school style of eatery is under siege, threatened by differing demographics and more diverse dining tastes. Just last month, Casino Deli on Welsh Road in Northeast Philadelphia went out of business after 35 years in operation. Even New York City, the undisputed champion of the Jewish deli, has seen its ranks depleted. The holy triumvirate of Katz’s, Second Avenue, and the Carnegie deli have suffered a temporary loss (with the last closing in 2015 due to a gas main upgrade project, but planning a reopening in 2016). “These days because there are so many fewer delis and the market has dropped so much [it is unusual],” says Ted Merwin, associate professor of Religion and Judaic Studies at Dickinson College and author of "Pastrami on Rye: An Overstuffed History of the Jewish Deli." Is this Philly pub the best Irish bar in Pennsylvania? That tradition lives on in this corner of Montgomery County where the owners and managers of both delis attest to the fact that they’ll still spot each other if the other runs dry. But if a kind of collegial competition persists, some things are changing. The Murray's Special: Corned beef, sliced paper-thin, on rye, with cole slaw and Russian dressing. 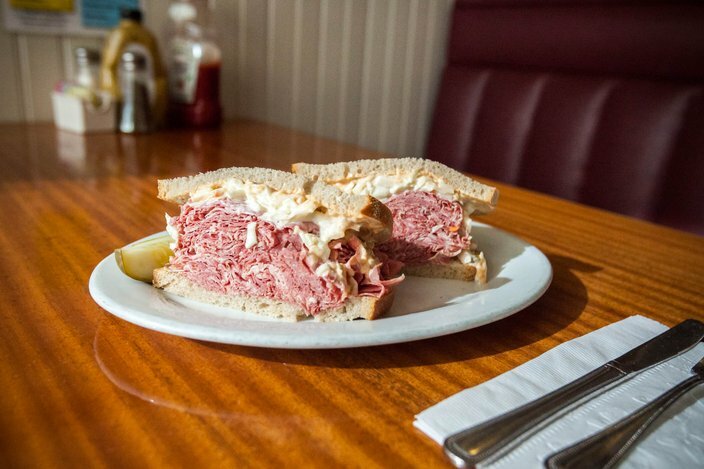 The Gantzer Knaker: Hymie's corned beef special – the meat is sliced thicker, with cole slaw and Russian dressing. 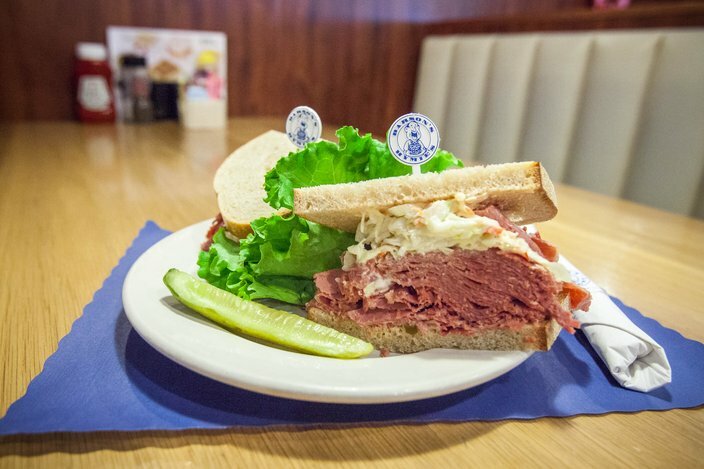 Hymie’s has largely abandoned the traditional Philadelphia deli sandwich, which served cold corn beef cut very thin and accompanied by Russian dressing and coleslaw (as opposed to the thick cuts of hot pastrami typical in New York). Barson now serves hot sandwiches with a thicker cut of meat, keeping it in a steamer to ensure the appropriate temperature. He notes that other Philadelphia favorites are still big sellers, with cabbage soup selling as well as matzo ball, and kippered salmon besting the New York favorite, white fish salad. In 2008 Murray’s was purchased by the Wakim brothers, a Lebanese family that owns a few other restaurants in the area, amid fears the new owners would change the business model. Instead the deli remains more firmly in the old school Philadelphia deli tradition, at least when it comes to the mainstay sandwich. Hymie’s and Murray’s may lend coffee creamer to each other, but that hasn’t precluded the occasional spasm of cold-blooded business stratagem. There are many other differences between the two. Murray’s sells beer and hawks their pickles out of a barrel, while Hymie’s is alcohol-free and has an expansive pickle bar. The latter is also substantially larger, at 3,500 square feet, with seating for almost 100. Murray’s seats a maximum of 50 patrons in a 2,000-square-feet dining room. 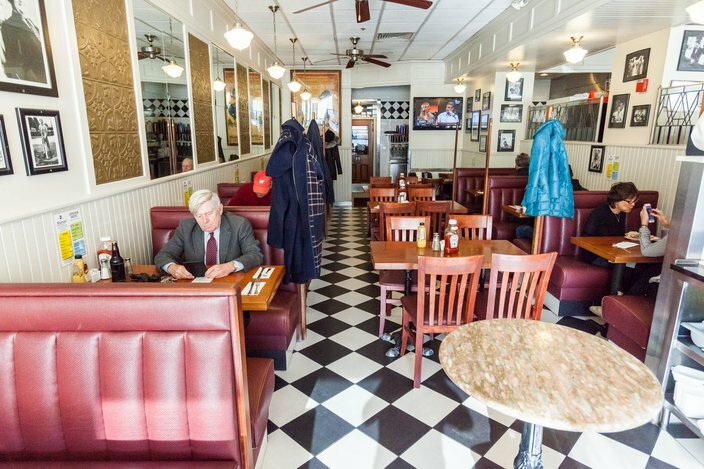 One group that neither restaurant is likely to be seating anytime soon are the Main Line’s burgeoning community of Orthodox Jews. (Both delis are Kosher style.) Instead members have been opening their own restaurants – like Our Kosher Kitchen and The Dairy Cafe – to meet the demand for strict Kosher eateries. 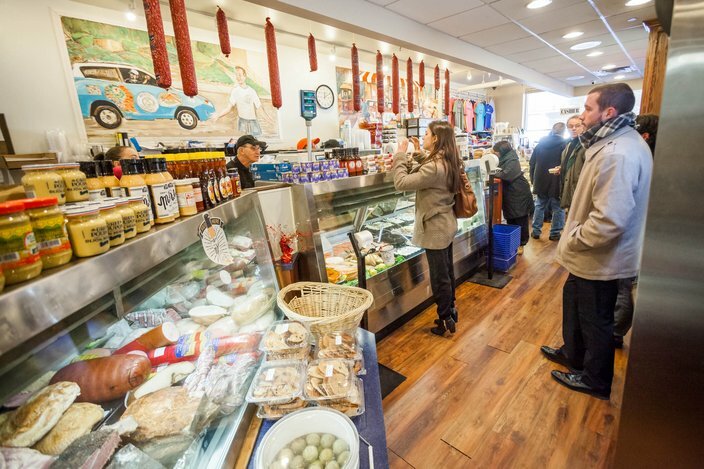 The deli counter at Hymie's Merion Delicatessen, 342 Montgomery Avenue in Bala Cynwyd. Part of the reason they are both still in business is the sheer size of the Jewish population in the Lower Merion area – and its stability over the years. In it latest population study in 2009, the Jewish Federation of Greater Philadelphia carves the region into seven distinct Kehillot, or “community consortiums,” which include broad categories like “Bucks” (as in the county of 625,000) and “Center City/West Philly/Northwest.” Lower Merion, however, is its own distinct Kehillot that covers 15,000 Jews and 14 separate synagogues. The Federation’s 2009 population study – which certainly undercounted the population by excluding those who only own cell phones – notes that zero percent of the respondent households in Lower Merion received food stamps in 2009, a year after the worst economic downtown since the 1930s. In Northeast Philadelphia, where Casino Deli was based, 13 percent of Jewish households reported receiving food stamps, which probably indicates a lesser likelihood of dining out. Additionally Jewish residents have been moving out of the Northeast, while the Lower Merion population appears more stable. The dining room at Murray's Deli, 285 Montgomery Avenue in Bala Cynwyd. Barson reports that Hymie’s, at least, is doing better than ever. In recent years business has actually been increasing and he reports 2015 as the restaurant’s busiest ever. Teti says business at Murray’s has “slowed down a bit” as more of the older clientele has died off and younger Jews are drawn elsewhere by an increasing diversity of restaurants in both the suburbs and the city. Meanwhile, the slowburning competition between the two Jewish establishments continues apace. Hymie’s and Murray’s may lend coffee creamer to each other, but that hasn’t precluded the occasional spasm of cold-blooded business stratagem. 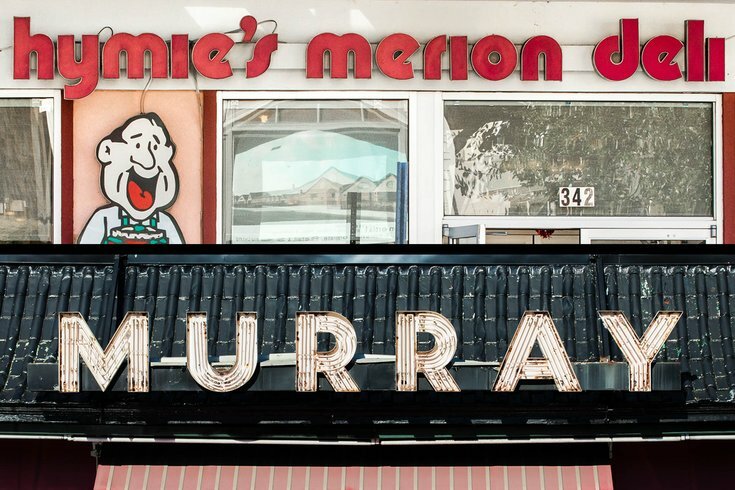 Before the Wakim brothers bought the other deli, Barson purchased the storefront next to Murray’s, essentially blocking his rival from expanding. In the past the space housed a temp agency and a specialty bakery, but today it sits vacant.